This "Historically Speaking" column was published in the Exeter News-Letter on Friday, September 14, 2018. Transcribing old documents can take you to places you never imagined. Back in 2003, Exeter Historical Society volunteer Bill Gustin was laboring away on the 1860-61 diaries of B. Judson Perkins. Perkins was a twenty-year old Exeter farm boy who was attending Phillips Exeter Academy with Robert Todd Lincoln. His observations on the events leading up to the Civil War had us transfixed. His daily activities in and around Exeter provided us with a window into our local world. Bill struggled all day on one sentence from October 11th, 1861. Perkins and his cousin, Moses, walked into town on a rainy Friday and Moses “engaged a pair of boots of God.” At least, that was how Bill read it. After checking every reference we could think of to define “boots of God,” we decided to look into who the bootmakers were in town for some help. One of them - the most popular - was Thomas Gadd. Boots of Gadd. The 1870 census lists Thomas Gadd and his two sons, George and Samuel as ‘cordwainers.’ By that time, Gadd had been in town since 1837. Born in England in 1817, to a lace weaver, his family moved to Massachusetts when Gadd was 11. They moved to Portsmouth sometime after that and young Thomas was apprenticed to shoemaker Benjamin Lovering, formerly of Exeter. At that time, in the early part of the nineteenth century, shoes were still made by hand one pair at a time. As such, shoes were highly valued by their wearer and a skilled cordwainer was needed in a community. You might remember the Mayflower trivia that pops up from time to time about Priscilla Mullins father, William, who used his valuable luggage allowance to bring twenty-one dozen pairs of shoes and thirteen pairs of boots on the crowded ship. Alas, Mullins wasn’t able to serve as the colony’s shoemaker as he and the rest of Priscilla’s family died in the first winter leaving her an orphan. At least everyone else had enough shoes for a while thanks to William’s over-packing. “Cordwainer” is a kind of old-timey word for shoemaker. In England, there is a distinction between a cordwainer – one who makes new shoes from new leather – and a cobbler – one who repairs old shoes. It’s interesting that in the United States these terms become muddied over time. Thomas and his son George kept up a brisk business in their shop on Academy Lane (now called Tan Lane), but the business of handmade shoes began to wane as manufactured shoes became more common. Both men are listed as either ‘cordwainer’ or ‘shoemaker’ in the census until 1900, when George’s occupation changes to that of a cobbler. By that time, he was most likely spending most of his days repairing shoes. Shoes and boots made by the Gadds were staples of the townsfolk. Author and lawyer, Henry Shute, remembered them in a piece he wrote for the Exeter News-Letter in 1932. “There were few families in Exeter fifty and more years ago, the members of which I remember with greater respect, appreciation and amusement than the Gadds. With the exception of Sam, who was a man of ordinary size, they were very small men, but extremely active.” Exeter was known for creating nicknames for everyone in town (a topic that should be discussed at some point). According to Shute, who kept careful track of such things, “the father was nicknamed ‘Hoppy’ from his brisk, short steps and his somewhat peculiar gait. But he was never called that to his face. First, because he was so thoroughly liked, and in the second place, because he had a peppery temper, feared no man and was master of a vituperative vocabulary that bordered on the sublime.” In the years following the Civil War, as mass produced shoes and boots hit the market, the Gadds continued to ply their trade to citizens and Academy students. Shute name-drops, “Hon. Amos Tuck, Dr. Soule, of the Academy, Judge Stickney, William B. Morrill, Captain Chadwick, Governor Charles H. Bell, Hon. 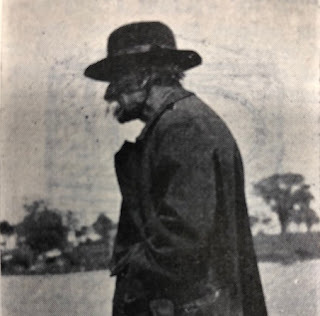 Alva Wood, Edmund Elliot and others regularly in the spring were measured for high cut, laced shoes, and in the fall for boots with legs reaching half way to the knee.” It seems Moses Perkins was in good company ordering his boots – which he was able to pick up a week after placing his order. Robert Todd Lincoln was said to have owned a pair of “Hoppy Gadd” shoes. According to John Templeton, editor of the Exeter News-Letter, the shop’s patrons, “are to be found in every section of the land, as the shop was ever a favorite resort of Academy students. They include Robert T. Lincoln and Hon. Charlemagne Tower.” Just imagine the son of Abraham Lincoln sitting on a barrel listening to politics from an Exeter shoemaker. Robert Lincoln was a careful dresser – perhaps he at least once wore his Hoppy Gadds into the White House after his father’s election. Think about that next time you watch “Lincoln.” Did they research Bob’s shoes for the film? We suspect not, as there are no emails in the Exeter Historical Society inbox from Joanna Johnston, Oscar–nominated costume designer, or Steven Spielberg. A lost opportunity for a fabulous back story. Thomas’s son, George, ran the shop until his death in 1921. “The little shop on Academy Street was long a town institution, a favorite resort, and many were the interesting discussions held there,” his obituary noted. “The Messrs. Gadd were men of marked individuality, well informed, and it was a real treat to hear them discourse on topics that appealed to them. Until quite recently, Mr. Gadd continued to operate the little shop, of recent years mainly on repair work, although to the last he made his own boots, of a type now infrequently seen.” With his passing, a town institution ceased.